Simple and advanced tips how to do things in sculptypaint, and get sculpties working in SL. 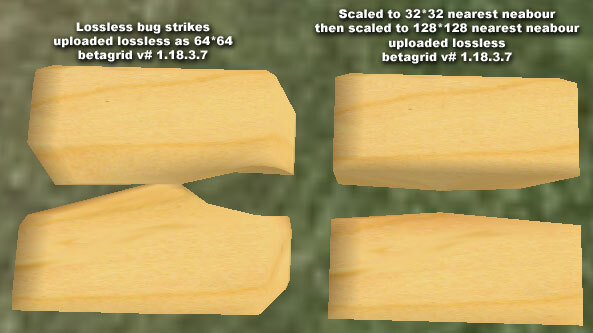 Since Secondlife shows/renders the 3D models only one-side how can I see if my model is turned insideout? 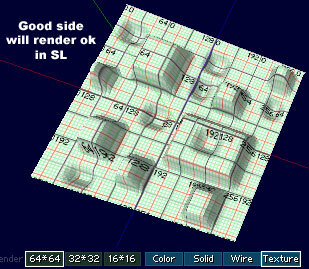 Render the model with the texture on, if the numbers are showing correct, you got the side SL will render / show correct. 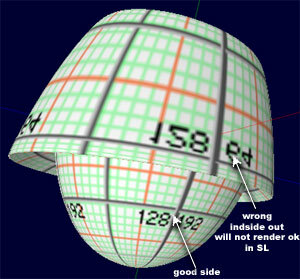 If the numbers are mirrored, in SL this will not render/show inside-out. The wrinkles around the poles seems to be fixed in the recent release and windlight client, but when modeling sculpties keep the poles checked of your model, I always check if the poles are really at one position, if not I scale them really small. It seems rather hard to modify points or rings where you want them, but there is a neat way to modify them using the axis, this method I use a lot. I can translate my whole model to a certain position, then scale a bunch of points or rings to zero on the axis there where i want / need them. 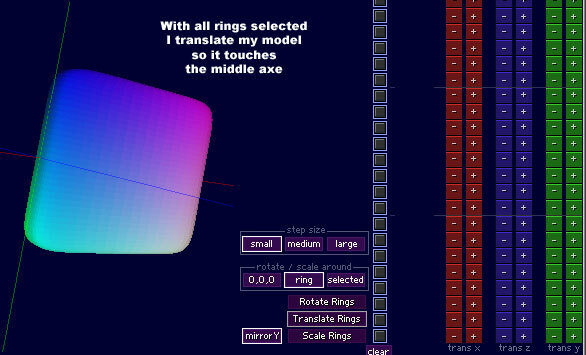 First I translate my whole model to 1 side of an axe. 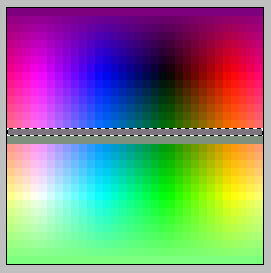 For the moment, you can copy your model into the A or B buffer in the morph tool, for temporary 'backup'. 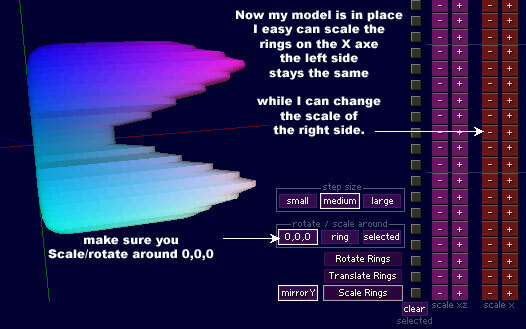 If you scale rings real small, so that a ring becomes just 1 point, secondlife will show that part invisible. Make sure the whole ring is all the same point/color. 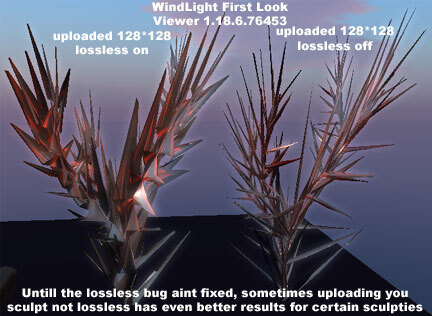 At the moment the lossless bug is kind of fixed in version 1.18.6+ But still can happen, when you go to an area with loads of textures, and then back to your place where your sculptie is, and your cached 'lossless' sculpty wont load correct again. - You can use an empty alpha-channel, but putting a logo in the alpha channel can trigger lossless bug. 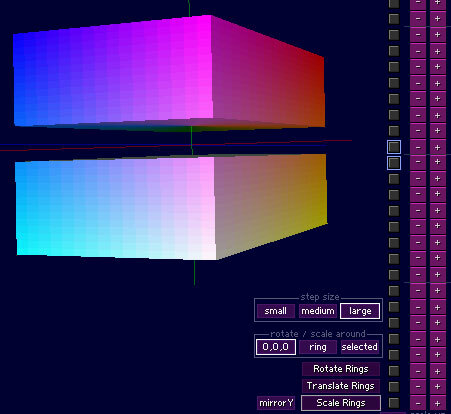 - Lot of detail/rgb-information data in your sculpty can trigger the lossless bug. Somtimes the losslessbug still strikes in SL. So for certain sculpties, I prefer to upload it 128*128 not lossless, since they still look ok.
Dont get hurt by the lossless bug, and load even faster I feel. When the lossless bug is kind of 100% fixed in the near future, it would allow pushing sculpties to the limit. The structure down here. are 3prims, one red, one grey and one black sculpty. Recently when I need to model a certain shape, I start with an 8*8 forced model. Edit those points, then smooth parts of it again when the shape is sort of done. Locking certain points while smoothing can keep the certain part of the shape intact. 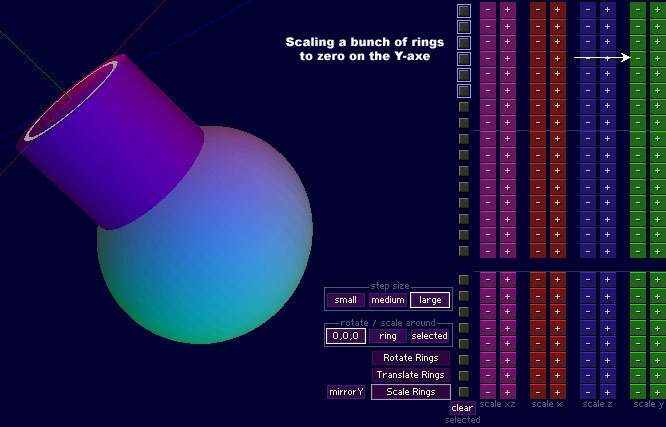 - It's much easier and faster to move/edit blocks of points or rings (4 or 8 rings the same time in the arch tool). - When zooming in and out, your shape will stay much closer/the same in SL.